It is said that the Conflaris are greedy, that they desire nothing more then material wealth, be it in gold, jewels, steel or ilthin. That they can sniff it out where it lies, that they will kill or murder just for a few precious nuggets of gold. Though yes it is true that they love gold and will hoard it away from all others, no Conflaris will kill for it, unless the stuff is taken from him by some lesser creature. It is this desire for wealth that drives the Conflaris and what makes them who they are. Physical Description: Short and broad, Conflaris seem built for their mountain homes. With arms as thick as a mans thighs and flesh of true living stone, their endurance is phenomenal. This coupled with the Conflaris natural hot-headedness can make the short warriors surprisingly hard to bring down in combat. Their flesh is normally a dark tone, the colour of earth or soil, though some Conflaris have skin the colour of paler stones. Possessing blood made of real magma, the creases in a Conflaris' flesh glow a dull orange, though they are quite cool to the touch. They are shorter on average than humans, though they weigh slightly more. Conflaris possess no hair, beards or eyebrows, though female Conflaris do grow long top knots. These are typically braided and plaited through with brightly coloured ribbons and gem stones. They perform the same duties as the male Conflaris; mining, stone working, weapon crafting, selling wares and looking after the mine animals as Conflaris society is primarily based on the merit of the individual, as opposed to some sort of inherited position. Personality: Conflaris are stubborn beyond common sense, preferring to cling to an incorrect argument, no matter how clearly it is wrong, rather than concede the point to their opponent. This passes over into their common lives, making each Conflaris driven by honour, desiring to fulfil their word as if they have no other choice. If a Conflaris says that he will do something, then nothing short of an army standing in his way will stop him and even then only once they have hacked the Conflaris to death. Conflaris are tenacious in defence and nigh unstoppable on the attack, their sheer endurance allowing them to face against foes that outstrip them, or numbers far greater than anyone should sensibly face. 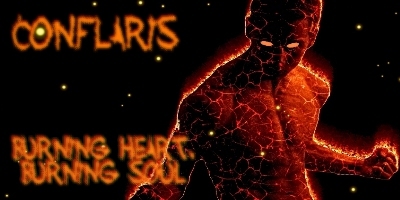 Conflaris resolve their decisions and debates through acts of physical prowess. The most typical method they select is either wrestling or the lifting of weights. They are also quite boisterous and cheerful, given to enjoy great feasts of meat, breads and ales. Hot-headed and fiery tempered, the Conflaris truly are the children of the Volcano God, Asgar however, given to swift rages that flare hot and pass quickly. Religion: Conflarian religion is a deeply private and personal matter, with the Race split evenly between their crafter, Terra the God of Earth and Asgar the God of Volcanoes and Fire. This is because whilst Terra made the Race, Asgar gave them their life, their HeartFire. As such most Conflaris worship both Gods but tend to prefer one or the other. Festivals are uncommon with the stoic Conflaris but they do have three major feastdays through the year, dedicated to their Gods and to their High Thane. These feastdays are marked with much drinking, feasting and merrymaking, with no-one working on the day. Even the High Thane himself helps to cook the meals on the feastdays. Relations: Conflaris get on well with most of the Races, though there are notable exceptions. Anvar, being the Eaters of Metal, have always been in competition with the Conflaris for resources and this rivalry has more than once spilled over into war. The Fae find the Conflarian city, Drazzahezz, abhorrent, being used to the open spaces, but they have no issue with the Conflaris themselves. Territory: The Conflaris are found in most of the human cities, having dedicated quarters in the larger two, Grath and Vorn. However, their largest population is in their two cities, the mountain Drazzahezz and the orbiting planet Dragons Eye. Conflaris and Ether Walkers crafted a Jump Gate to Dragons Eye and there built a small city to mine the planetoids precious iron. It is from here that most of Tal'Vorn's weapons come from, forged from the red rock of the moon. Language: The Conflarian spoken language is a closely guarded secret amongst their people, with very few outsiders being trusted enough to be taught it. Their written language on the other hand adorns nearly everything they craft, decorating their walls, weapons, armour and jewellery. Formed of simply shaped runes and more complex pictograms the language is surprisingly flexible, and is often used on magical items as a way of binding spells into weapons. Place your faith in our Lord Terra, in the stone and in the steel. They will guide and protect you.